It's not always easy shopping for vegan friends and loved ones. Animal products have a way of slipping in where you might least expect them, and nothing says "gift fail" like accidentally giving your vegan spouse a lip balm made with beeswax. The long list of animal ingredients to be avoided may seem daunting, but this guide to vegan gifts is here to help. Every one of Lee Coren's vegan bags are wonderful, but this fun and lovely crossbody bag would make an especially great gift because, well, it's just so fun and lovely. Comes in a choice of colors and straps. Vegan yogurt can be rather pricey, but making it at home is easy and affordable. Plus, imagine the boasting rights! This Cultures for Health starter kit is a great way to start making dairy-free yogurt with nearly any non-dairy milk, and it's great for beginners. You can combine it with a yogurt making machine as well – there are a many choices in the $30-range – but one is not required. OK, my favorite 17-year-old vegan is getting this sassy tote from Vegan Illustrated – in fact, I already ordered it. (I hope she doesn't read this gift guide. If so, Ella, I'm not talking about you, really.) Sorry, not sorry. Swoon. These gorgeous-smelling candles should be on every vegan's gift list! Using 100 percent natural soy wax instead of that made from bees, the candles are hand-poured and are scented with phthalate-free fragrance. The ones shown here are the standard size, but they also come in a super-cute mini size as well as large. Being vegan is great ... unless you are an ardent fan of gummy bears, which are generally made with pork or bovine gelatin. 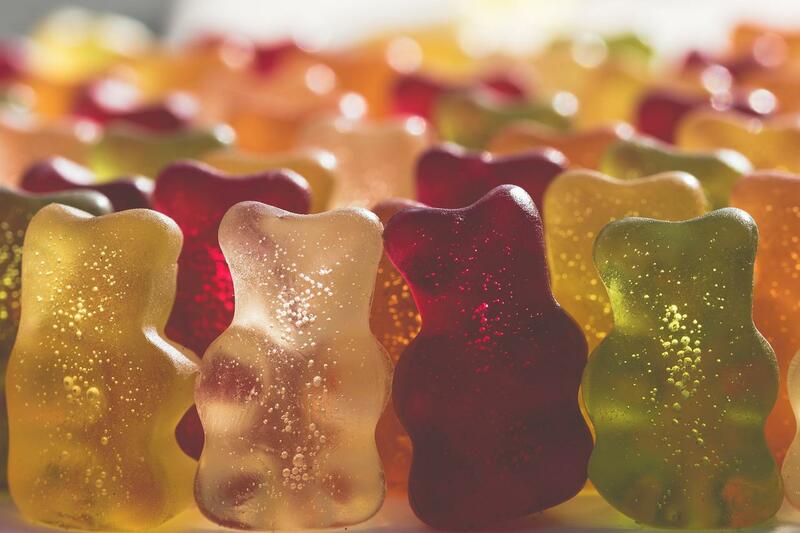 If you have a vegan gummy-bear freak in your life, here is the answer: A BPA-free gummy bear kit with vegan recipes! You will be loved forever. Animal hair is commonly used in makeup brushes, but many vegan versions are also available. EcoTools offers brushes with super-soft synthetic bristles, and handles made from bamboo and recycled aluminum. The Day to Night set is pictured here, but the brushes can also be purchased individually. EcoTools uses recycled and recyclable packaging. Desert Essence doesn’t test any of its products on animals, and also requires that its ingredients suppliers don’t use animal testing either. These body washes are vegan, and also made with a number of certified organic ingredients. They’re also free of artificial fragrances, parabens, phthalates and phosphates. Fragrances include Green Apple & Ginger, Spicy Vanilla Chai, Bulgarian Lavender, Sweet Almond, and Fragrance Free. What a great bag this is, made by Badimyon - Vegan Bags. Super stylish and all vegan. And at 12.6" by 10.2" by 4.3" – it's roomy too! There's a lot more photos at the link below. What makes these pretty truffles by Witerki all the more sweet? No animal products, that's what. The truffles are all handmade, and you can request them to be personalized and/or custom made depending on allergies. You may have thought that a piece of vegan couture from the Stella McCartney label was out of reach, but it doesn't have to be. Meet the online consignment shop, The Real Real, in which gently worn (and sometimes brand new) fancy things are sold at a fraction of their retail prices. I love this site and they always have a great, rotating selection of Stella pieces. Prices for some items are still pretty high, but you can sort by low price to get some amazing deals for the vegan fashinista/o in your life. Even innocent little crayons can be made with animal products; steric acid is a product that may be derived from animal sources, and is a common ingredient found in crayons. These vegetable-based crayon blocks are made with organic ingredients and soy wax, and non-toxic colors. They’re a great gift for kids or creative grown-ups. Beeswax is included in many a lip balm, but these pretty lip tints don’t have any animal products. The gloss has just a touch of color and also moisturizes, thanks to essential fatty acids from avocado and coconut oils. Pacifica is a great go-to maker of beauty products that are vegan and cruelty-free. They also sell body products, skin care products and nail polish. A sweet DIY gift for the sweet vegan DIYer in your life. The kind-of popular woman above was seen sporting a pair of Veja V-10 sneakers aboard a boat in Sydney Harbor recently ... and the crowd went wild. We love this brand. The company pays attention to every detail in the chain of production, making what they call, "environmentally friendly sneakers, made with raw materials sourced from organic farming and ecological agriculture, without chemicals or polluting processes." While the shoes worn by the Duchess above include leather, check out their whole line of super cute vegan shoes below. The ultimate vegan TreeHugger gift – small "leather" goods made from leaves! Not only are these nifty accessories from Tree Tribe hand-crafted from durable plant-based materials, but for every purchase, the company plants ten new trees.